The conference will take place in Estoril, a beautiful village located at about 20 km of Lisbon centre (see Map 1). The international airport of Lisbon is about 40 minutes from the venue. There is a direct bus-shuttle from the airport to Estoril every hour, from 07:00 to 22:30 (see details and timetable). The price of one individual ticket is 7.72 euros, the luggage transportation is free and the bus stops in front of the Hotel. If you are arriving by plane at Portela, we strongly recommend you to use this service. - Train: Take the train in downtown Lisboa, in Cais do Sodré station and get out in Monte-Estoril or Estoril stations (Monte-Estoril is closer to the conference venue). consult the timetable of "Cascais line". - Car: Take highway A5 (direction Cascais) and leave in "Estoril" and drive near the sea (see Map 2). - Taxi: an average ride from the airport to the Hotel Estoril Eden can cost about 35 euros (at night or during the weekend/holydays extras will be charged). We do not encourage you to choose this option, since taxi drivers are not always very reliable. Anyhow, if you decide to choose this option, ask for an estimate price (including luggage transportation) before getting into the car. Map 1 - Location of Estoril (lower left) in relation to Lisboa and the international airport of Lisboa, Portela (upper right). 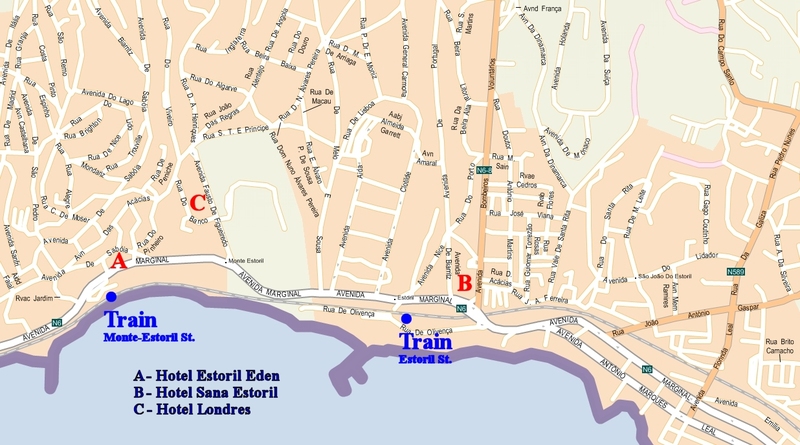 The conference will be held at HOTEL ESTORIL EDEN (see location in Map 2). In order to get special rates please make your hotel reservation through the IbPRIA 2005 website.